I feel like I hear my mother’s voice in the Prophet Elisha. Together they say, “If I had asked you to do something difficult, you’d do it -- then, why can’t you take out the trash?” The situation in 2 Kings 5 is that General Naaman, commander of the Pagan Kingdom of Aram’s army, has incurable leprosy. His undocumented alien servant girl tells him of the healing power of her faith and Elisha’s particular capacity for doing miracles for the hopeless. Naaman sends a message through diplomatic channels asking that Elisha come to Aram and do his magic. This is Elisha’s golden opportunity to play the palace and give a really great evangelistic sermon. If you want to know what Jesus would do if he were in Elisha’s shoes, then look at Luke 10:1-11. Jesus would have sent his ragged crew of disciples over to Aram as his representatives. 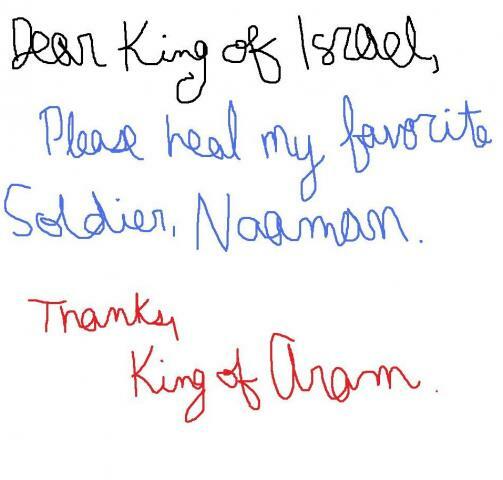 He'd have them go village by village healing everyone, and when they got around to Naaman, they would heal him too. Jesus’ approach is very simple. He doesn’t equip his missionaries with 52 sermons or a book of recommended hymns. He says, “Go without purse, bag, or sandals.” He invites them to trust the group process for congregational formation, to discern the Holy Spirit, and to enter into face to face relationships. Most of all, he tells them to simply live the Gospel; heal the sick, teach, and be loving in all that they do. If he was asking something complicated of his disciples today, we would do it. We love going off to seminars and accumulating heavy instructional books on how to renew the church. Jesus says, “Live the Gospel; heal, teach, love.” How about beginning with something as simple as praying with or for each person we know? General Naaman, commander of the Pagan Kingdom of Aram’s army, is a lot like us. He is told by Elisha that his leprosy problem will be solved if he goes and washes seven times in the Jordan River. Naaman throws a temper tantrum. He wants to see Elisha in person. He wants the prophet to don flowing vestments, dance around him with rattles, bless him with a voodoo incantation 86 stanzas long, and prescribe him medication that he’ll have to go to Canada to afford. Like many people in the modern world, his expectations are that the complex issues of his life require equally complex solutions. Accepting Jesus into our hearts is simple. Living as a Christian today requires a certain simplicity. It is often the simplicity of our faith that is its stumbling block. We want a ten step program to deal with our annoying ex-spouse, instead of the simplicity of Jesus’ command that we forgive, bless, and pray for our enemies. We want to subscribe to the latest renewal program for our church, rather than simply commit ourselves to live the Gospel; heal, teach, and above all, love. How about beginning with something as simple as praying with or for each person in our congregation that they might receive what they need as gather each week?